Camped at Cold Springs trailhead night of June 20. A wet but comfortable night. Set off in mixed rain and snow. 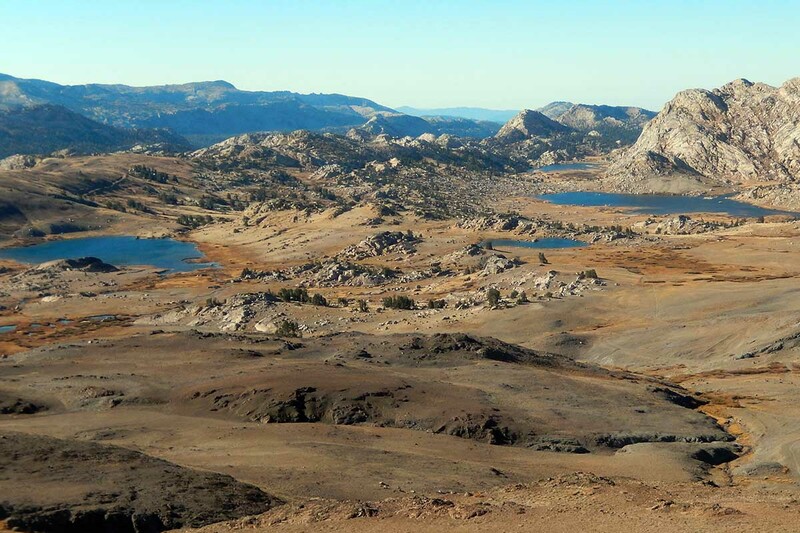 Progress slow in these conditions and had to pitch tent at 8,800’ by early afternoon. Stayed in the tent for remainder of day and that night - howling gale and constant snowfall. The basic tent stood up remarkably well. 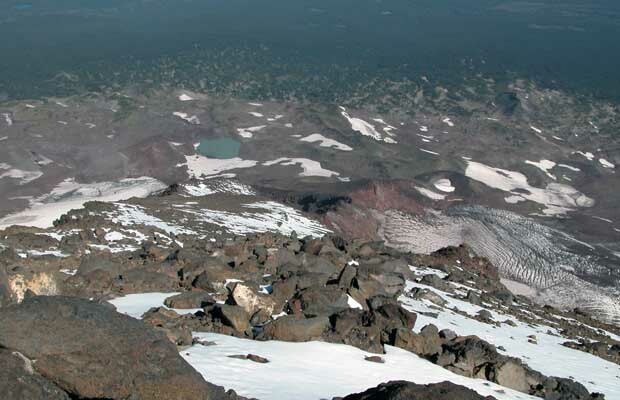 On June 22, the weather clear and cold with my campsite above the cloud tops. Began climbing at 7 am and arrived at the summit by 1 pm. 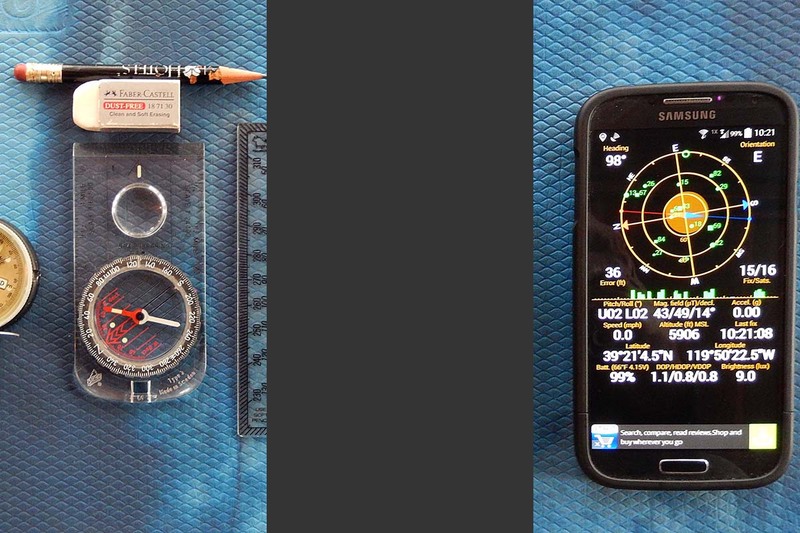 Clear conditions, but with a constant cold wind from the west. I took the eastern side of the south face to Pikers Peak at 11,657’. Easy climbing in parts, with some hidden crevasses. Spent 30 minutes on the summit -12,276’, with no one else in sight. 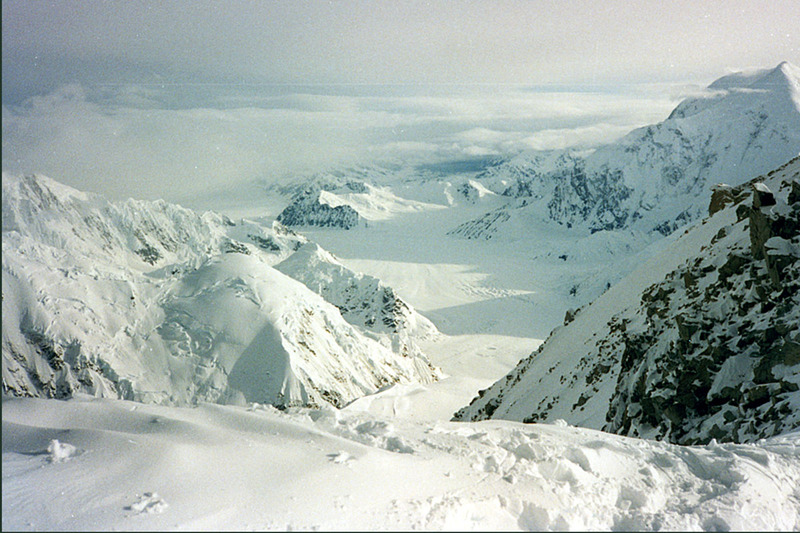 Then descent via the glacier on the western side of the ridge. 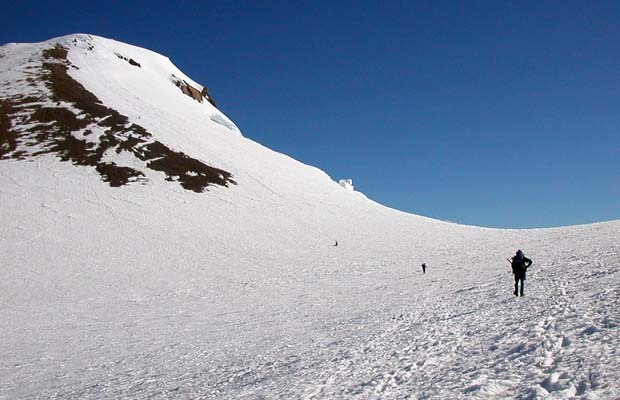 Met two climbers ascending the glacier, otherwise totally alone on the mountain. Back to my tent by 4 pm, packed up and down to Cold Springs by 7 pm. 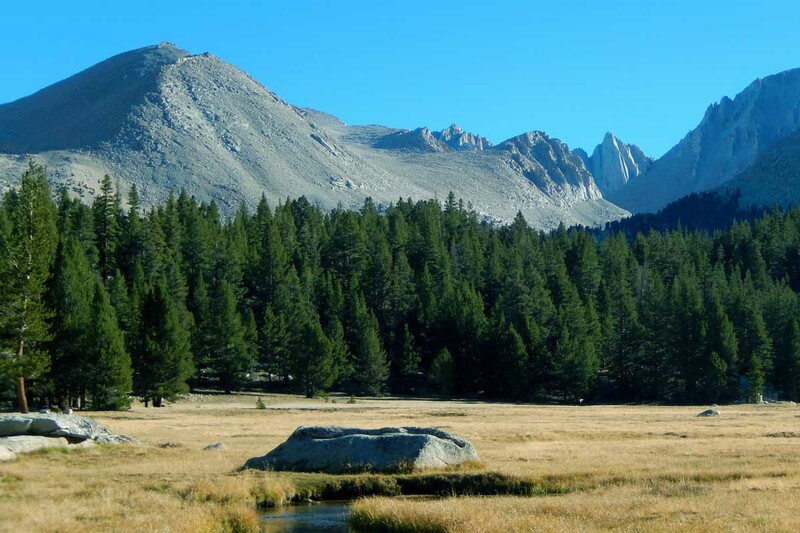 A great mountain in a superb wilderness area. Worth many more visits. 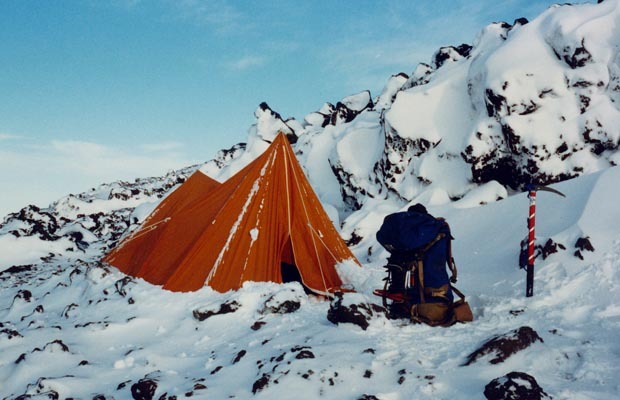 1987: My basic tent at 8,800' after surviving blizzard conditions for 20 hours. 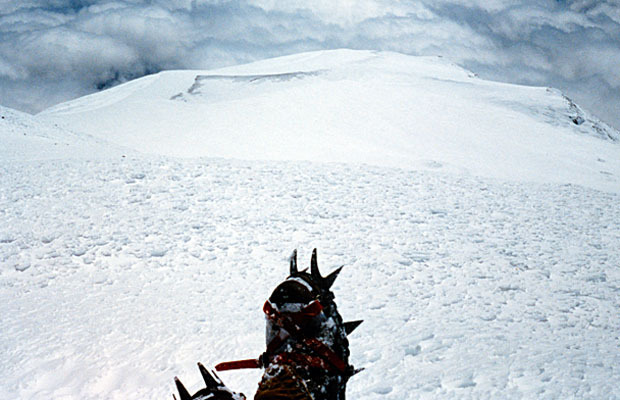 1987: Looking down the route that I'd taken from Cold Springs ... in a blizzard. 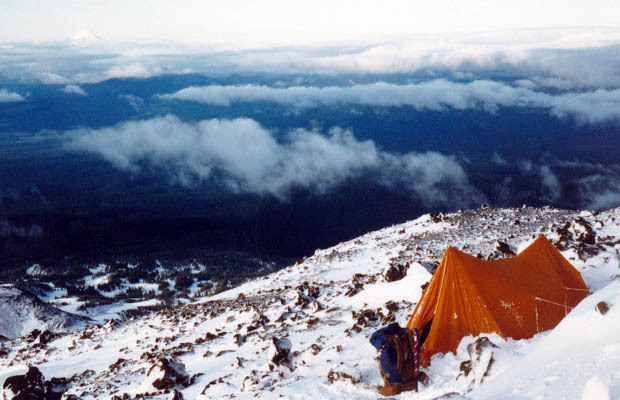 1987: Early morning departure from my campsite to the summit. 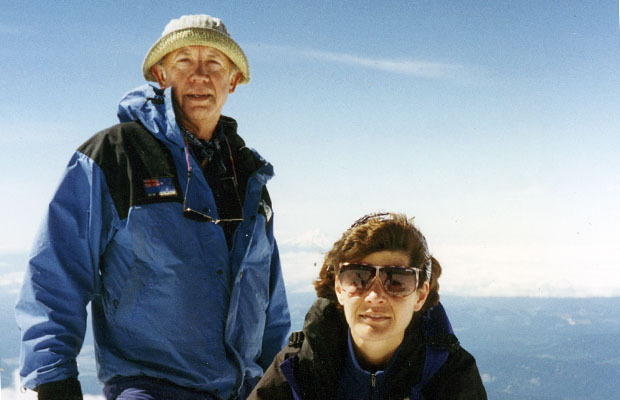 1995: With Lucy on the summit of Adams for her first ascent of this peak. 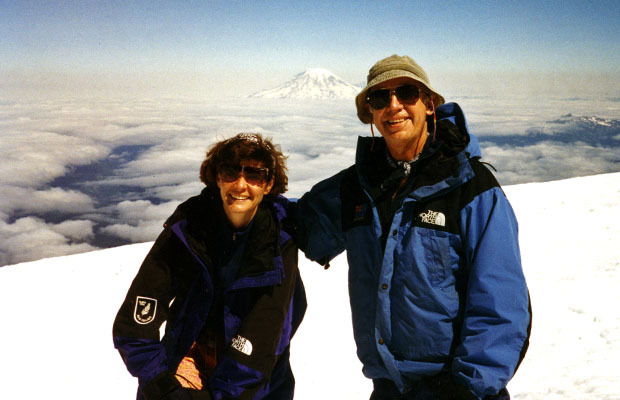 1995: With Lucy on the summit of Adams - Mt Rainier in the background. 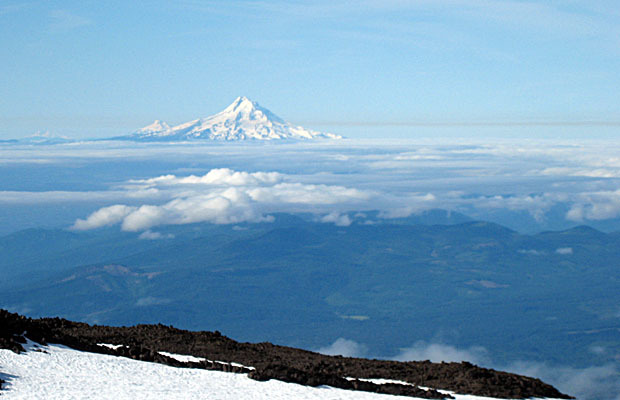 1995: A southern view from the Lunch Counter-Mt Jefferson and Mt Hood in the background. 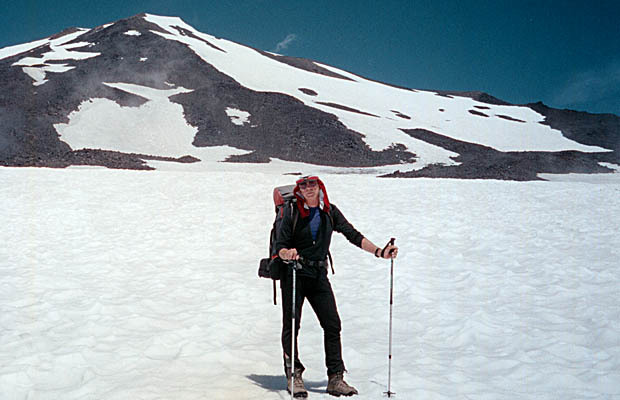 1998: On the descent from the Lunch Counter to Cold Springs trailhead. 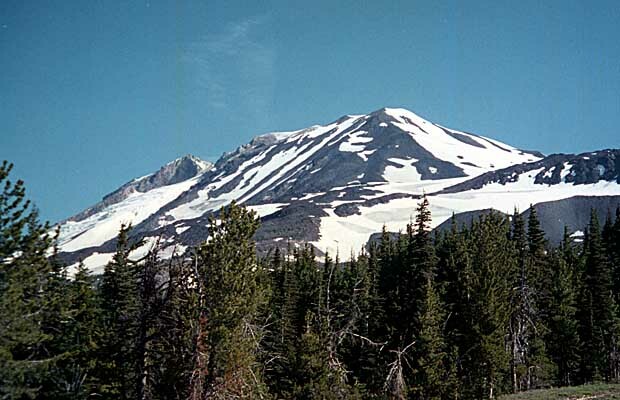 July 1992: Mt Adams -the gentle giant. A wonderful return climb to this mountain. The forestry roads from Trout Lake have not been improved. Left Portland at 4 am, reached Trout Lake two hours later, by way of I-84 to Hood River. Left Cold Springs camp at 8 am. Followed correct trail to snow line this time but still made error of climbing the crescent snowfield. 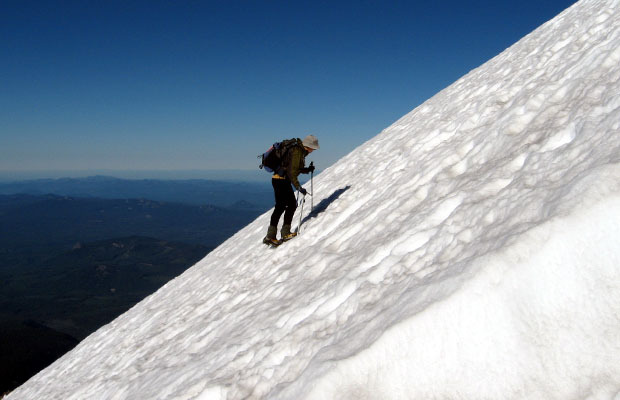 The easier way is to bear left onto the rock ridge- line and follow to the higher snowfield. A hard grind up to Lunch Counter at 9,000'. Made it by 2:30 pm, with fellow climbers, Steve and Eric, close behind. Campsite sheltered by rock outcrop and man-made rock walls. A good sleep and up by 5 am. Roped in lead with Steve and Eric, ascended the eastern side of Susdorf Ridge. Some falling stones but otherwise a good climb up to the false summit -Pikers Peak! On the summit by 11:30 am, having left camp at 7 am. Not a bad time considering the route we took. Eric nearly killed by slide into deep crevasse just below summit. I saw it happening -in slow motion -called out - and with 10 feet to spare, he used his ice axe to stop. 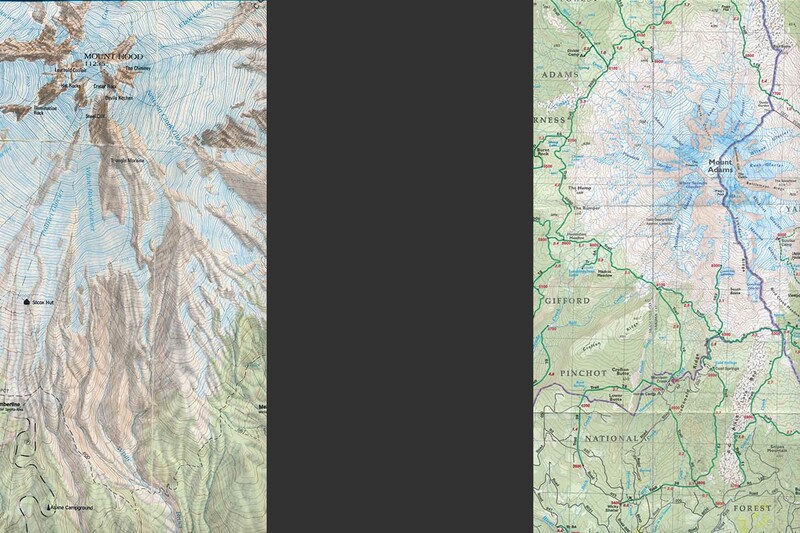 We glissaded down to the Lunch Counter, packed up and down to Cold Springs. Back at Portland airport by 8 pm. 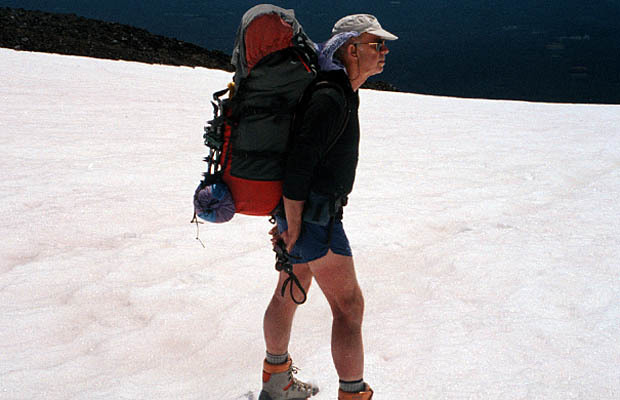 August 1999: Back from Adams again, triumphant, somewhat sore and pleased to be down from very nasty mountain weather. 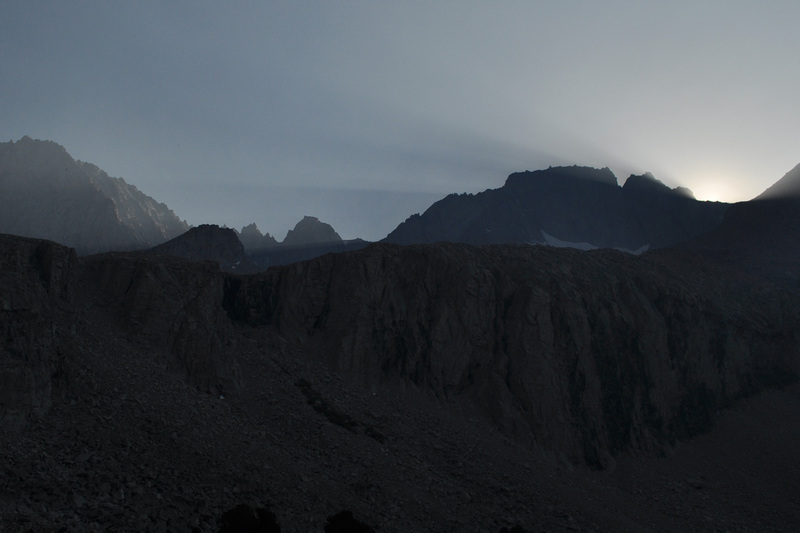 During my first night at the trail head -5,600', a line of thunderstorms passed over the mountain producing hail, heavy rain and numerous lightning strikes close by. Fortunately I was sleeping in the back of the truck and not up high in a tent like many climbers sitting out the storm at 9,000'. 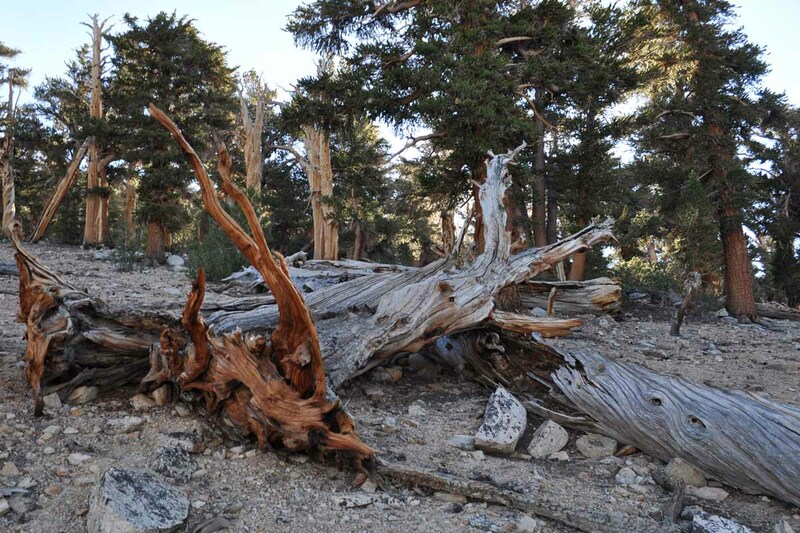 Next morning on my way up to the the Lunch Counter site, I passed these climbers in retreat after experiencing a terrifying night in the open. 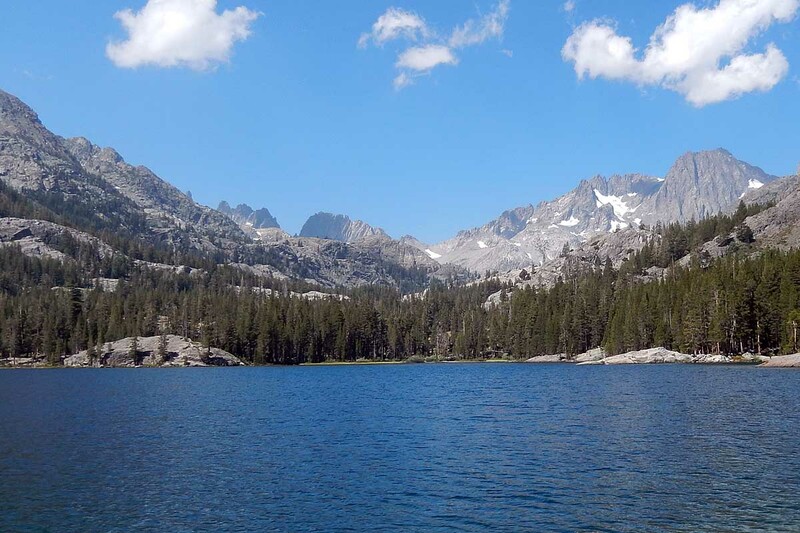 Although the weather was still unstable, I continued to just below the 9,000' level before hastily erecting my tent in the teeth of another storm ... this time much milder than the night before, with occasional hail and heavy rain but no lightning strikes in the vicinity. I left for the summit the following morning in windy overcast conditions, eventually reaching it in whiteout conditions, route finding by compass bearings and placement of wands to find my way back. Needless to say, few other climbers were in evidence on the top third of the mountain and I had the summit to myself ... I think? 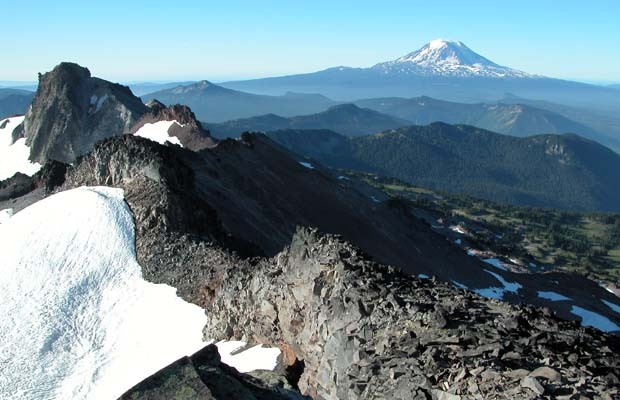 The Adams trailhead road only opened a week ago, and that thanks to a SAR on the mountain. 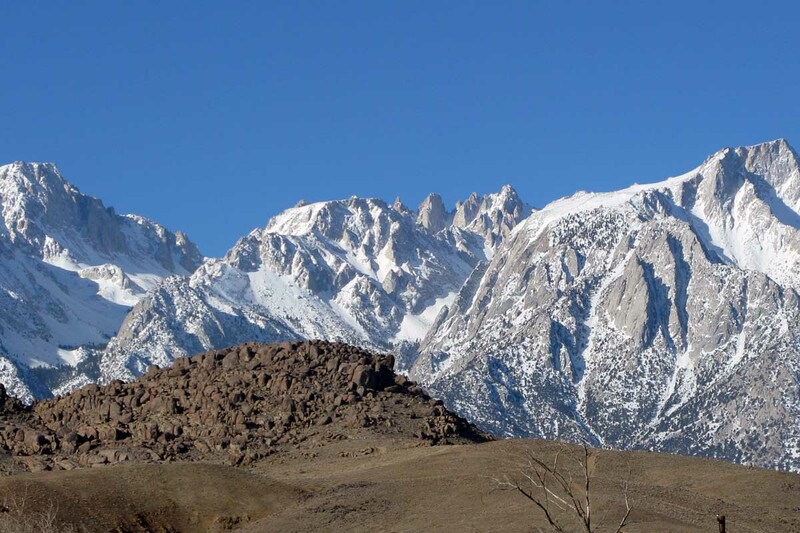 It's amazing how much snow is still down below the tree line and how little snow exists on the summit areas. 2001: Climbing with Mal Hill on our way to the Lunch Counter from the trailhead. 2001: Mal on the last section of the summit climb ... Piker's Peak behind. 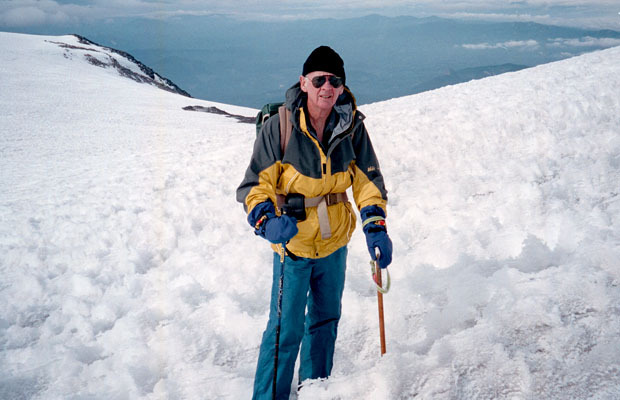 2001: On the summit of Adams in white-out conditions - nothing to see here! 2003: At the Cold Springs trailhead with Lee Sampson from Australia. 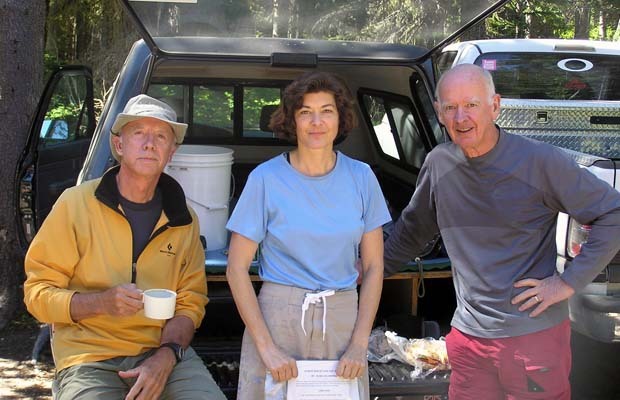 2003: Lee & Ken Sampson, and Peter, resting at our camp on the Lunch Counter. 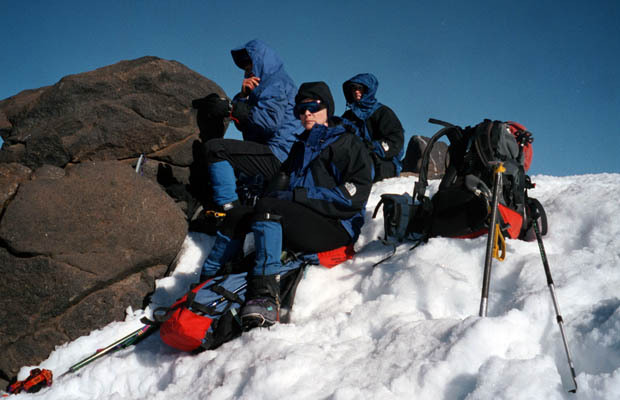 2003: A local team of climbers above the Lunch Counter ... doing the south-north traverse. .
2003: Following Ken and Lee from Piker's Peak to the summit knoll. 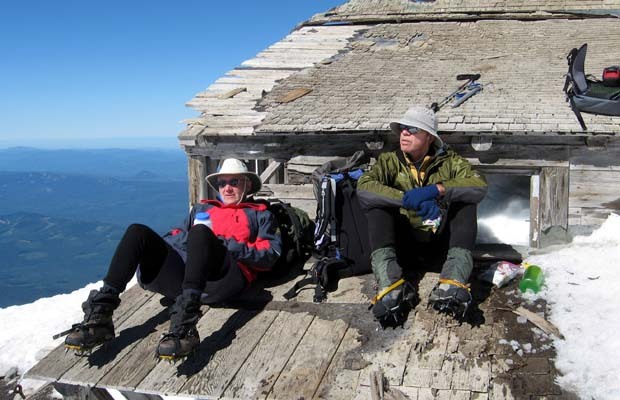 2003: Ken and Lee on the summit of Adams with Mt Rainier in the background. 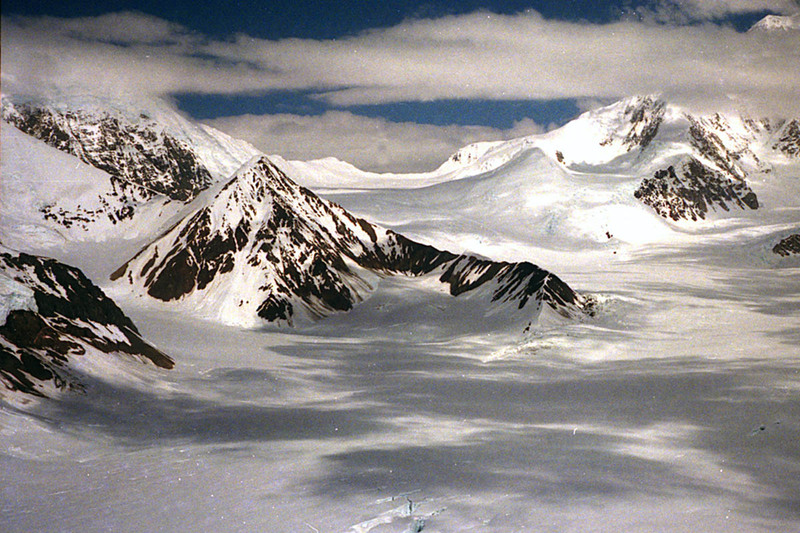 2004: The North Cleaver from my camp - for my solo attempt at this rather hazardous route. 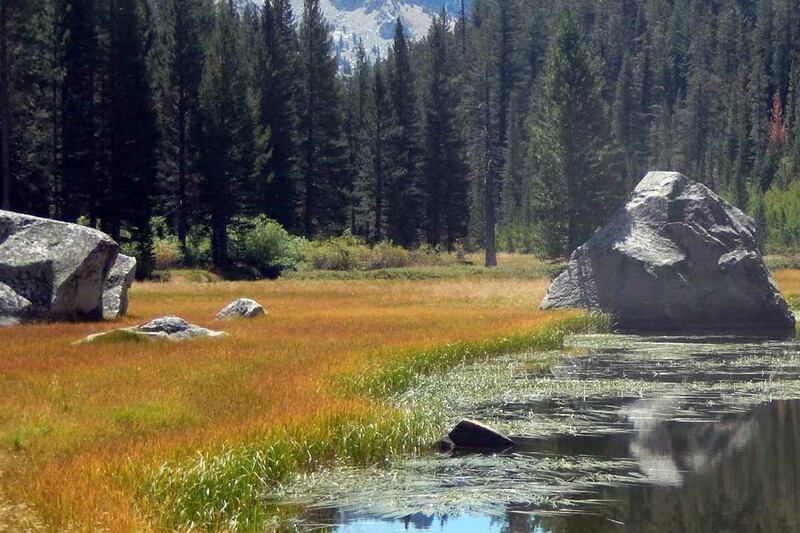 2004: Looking back down the North Cleaver to my campsite by the glacial lake. 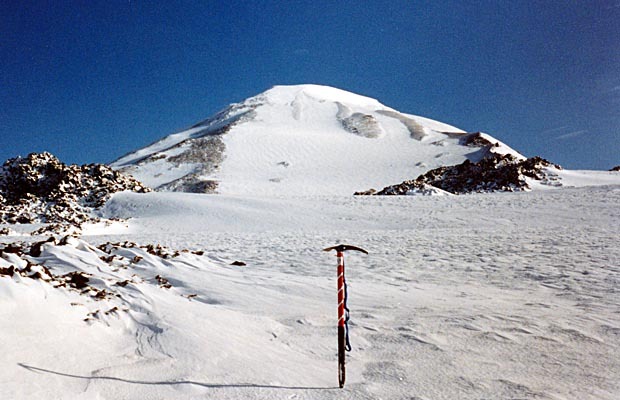 2004: Approaching the top of the North Cleaver - the summit 30 minutes away. 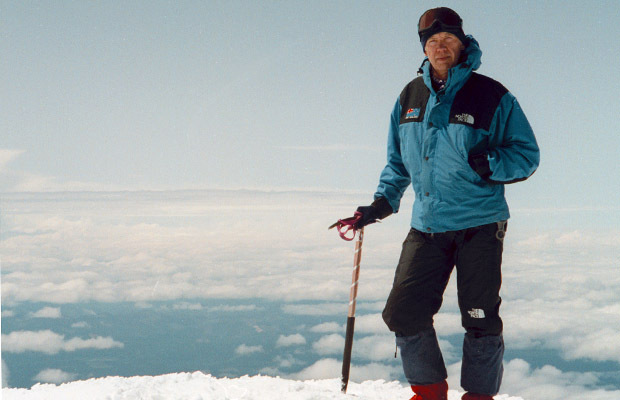 June 2001: My first big climb for the year, a prelude to Mal’s arrival next week. The Cold Springs trailhead access road opened very early ... it wasn't until the first week in August two years ago! 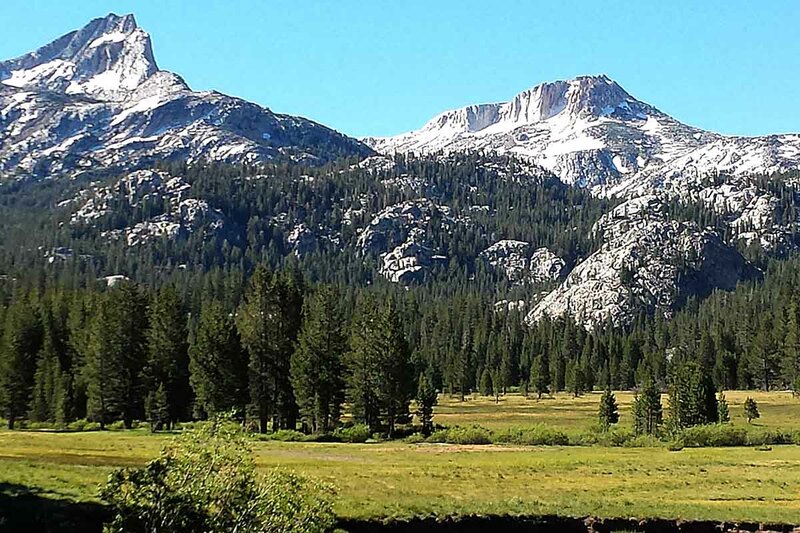 So, this time, little snow down low but plenty on the mountain proper which allowed a direct route from Cold Springs trailhead to the Lunch Counter. Took me six hours to a campsite at 9,283’. Left for the summit at 6 am , reaching Pikers Peak at 9 am and the summit at 10:40 am ... a very good time ... close to my best! Back to the tent at 1:20 pm and down to the trailhead by 3 pm Overall, I should be pleased with my times and that I returned home without too many aches and pains ... a good sign that I’m probably quite fit. My new Sportiva boots worked well. Another return to Adams; this time with Jeff Warner and Pat Jenkins. The weather warmer than last week, but oh so very windy at the campsite and the summit. Our times were even better than my feeble efforts a week ago: Cold Springs to the same campsite at Lunch Counter took 5.7 hours. 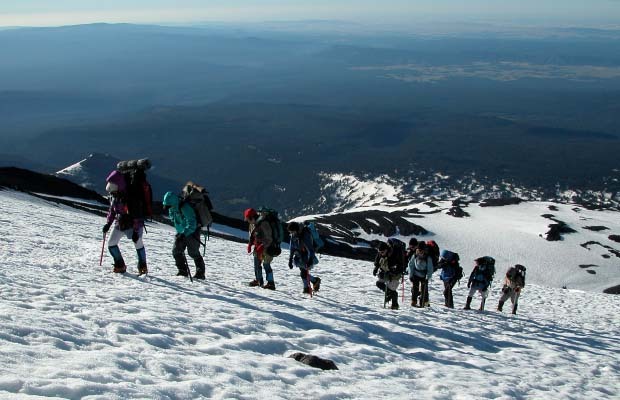 The summit climb on June 22 took 4.3 hours – definitely a record. 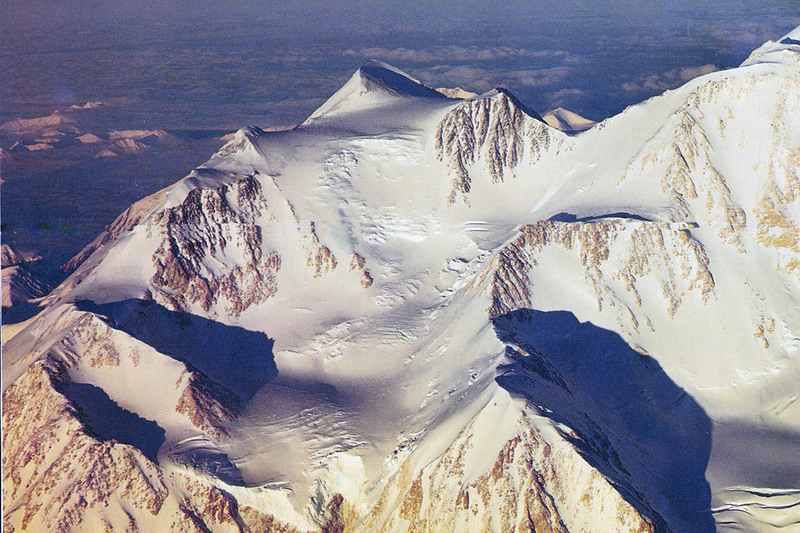 The last Adam's climb for 2001 was a two day marathon with Mal Hill, climbing the mountain in record time - 4.8 hrs to Lunch Counter & 3.2 hrs to the summit, faster than I've ever done it in my previous 12 climbs since 1987, probably because we were very fit after weeks climbing in the High Sierra. Mal's heart problem showed up during the overnight camp at 9,500', but not enough to deter the summit bid the next morning, which we did in blizzard conditions, requiring the services of my handy dandy GPS to get us back to the tent and out to the trailhead in cloud and pouring rain. Anyway, it was a grand finale to Mal's climbing career; one that I immortalized with a movie, using video footage taken on all the climbs we'd done. Mal returned to Brisbane much earlier than planned; eager to be checked out by his cardiologist. As it happened, this wasn't Mal's last big climb - but that's another story! 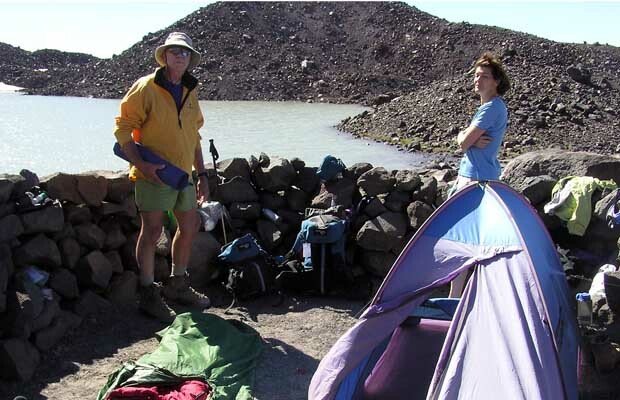 2003 with Ken & Lee from Brisbane: Our third and last climb was Mt. Adams. 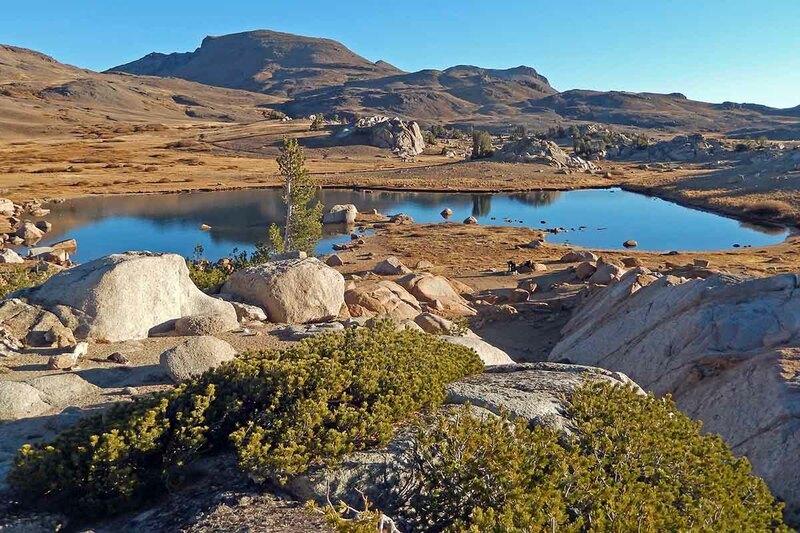 Although this peak can be climbed in one day, the choice of spending a night camped on the flat area known as the "Lunch Counter" at an elevation of 9,000' is a very good option to allow some altitude adapt ion before the summit ascent to 12,280'. 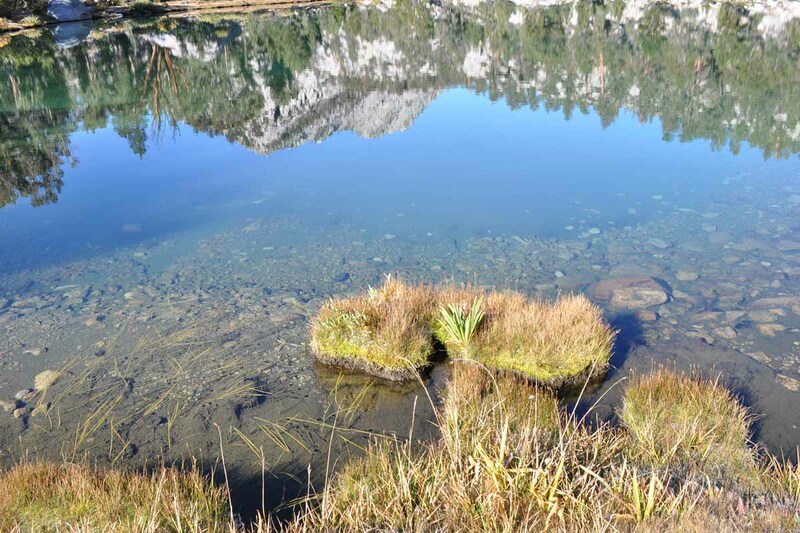 We were rewarded with excellent weather for both days on the mountain, a comfortable night’s sleep and tremendous views from the summit. 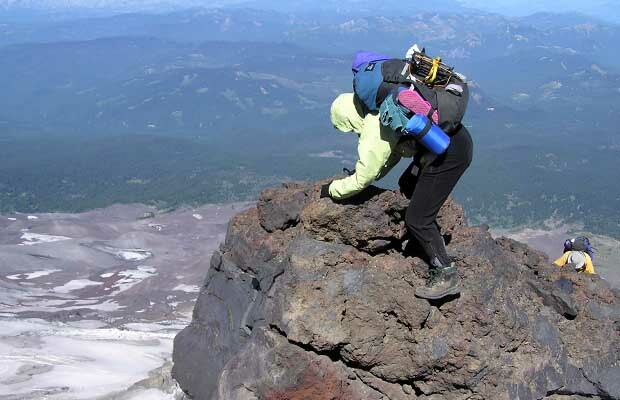 Since the summer of 1987, I've climbed Mt. 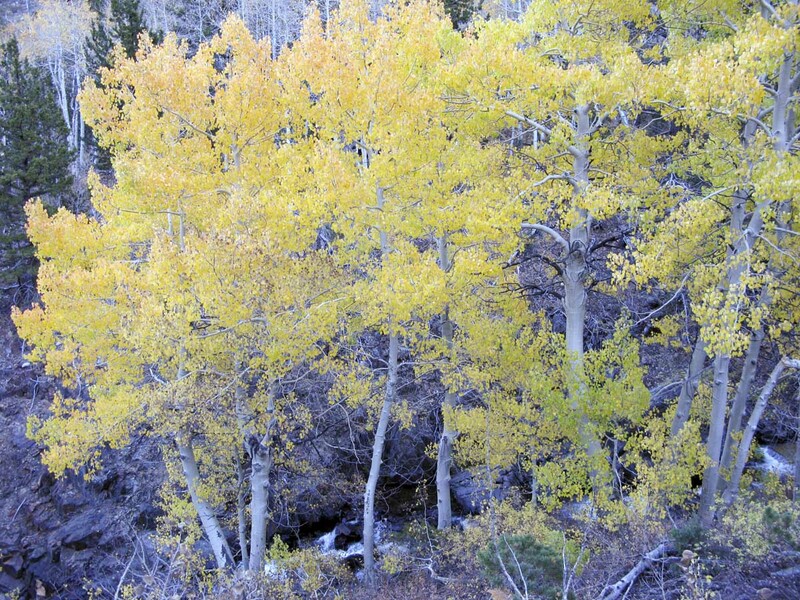 Adams at least 20 times and always from the 'easy' southern route that begins at Cold Springs trailhead. 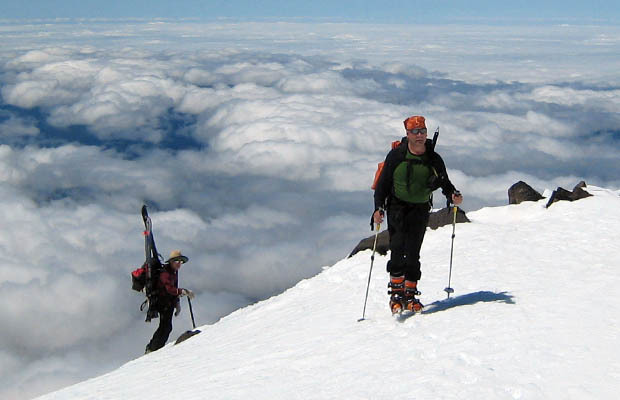 This southern route provides little difficulty, requiring a minimum of an ice-ax, crampons and no ropes or crevasse crossing hardware. 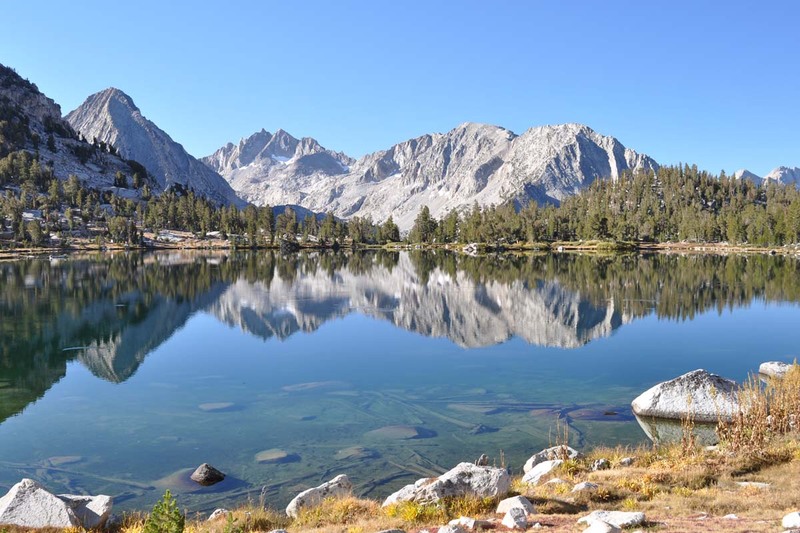 The route starts at an elevation of 5,600 feet, leading to a convenient bivouac location at 9,000 feet with protected level tent-sites; and from there the ascent to the summit, 3,300 feet above, is made via a moderately steep snow-slope. 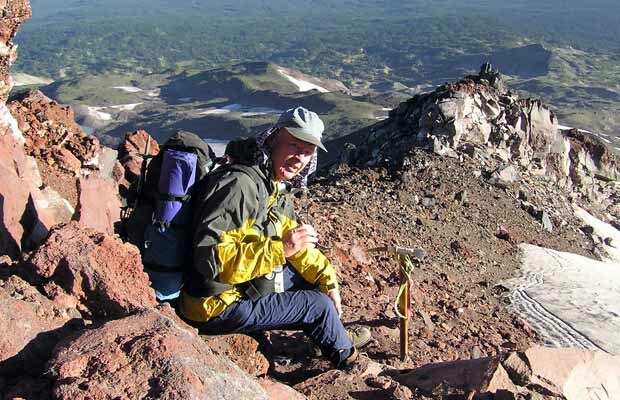 On August 9, 2004, I decided at short notice to climb Adams. 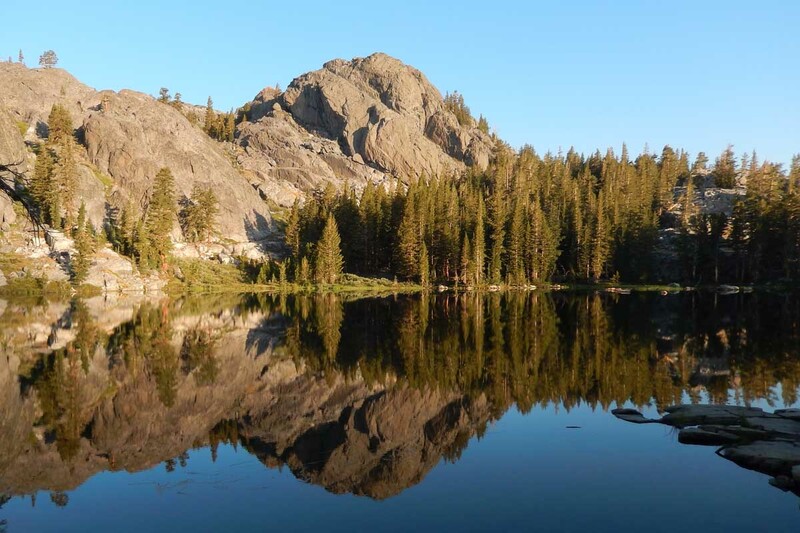 In the event, I was advised by the Trout Lake Ranger Station during registration for the climb that the southern route had just been closed because of a forest fire in the Cold Springs area. 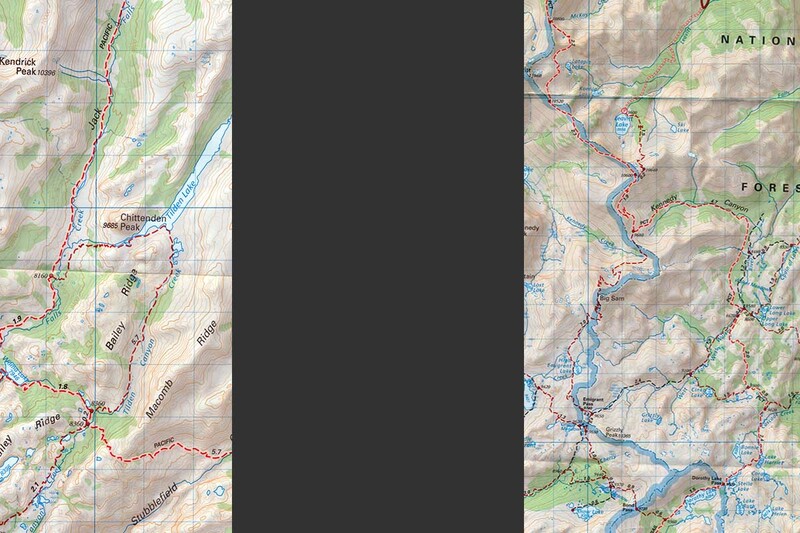 This left me two choices: either forget about the climb and drive the two hours home or attempt one of the more difficult ascent routes on the northern face of the mountain. Not to be deterred from a climb, it was with some trepidation I drove the additional 20 to 30 timber road miles to the northern sector of Mt. 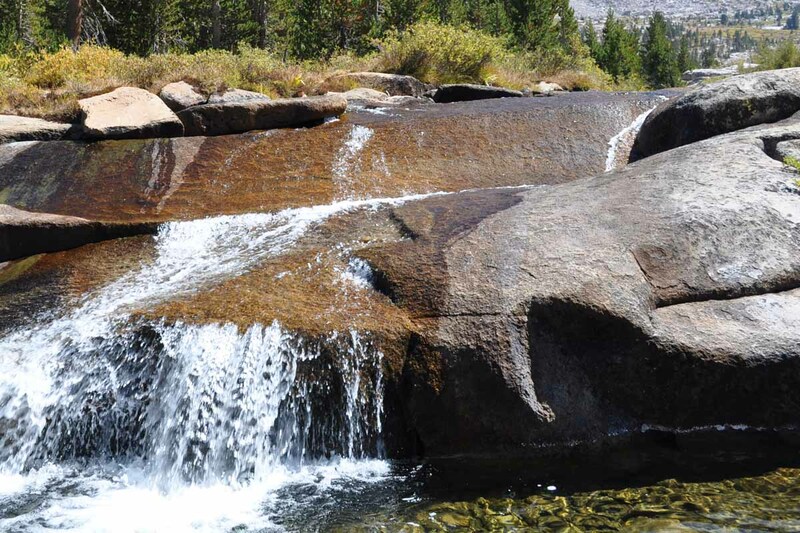 Adams with a plan to spend the night at the Killen Creek trailhead, then leave early the next morning with backpack and climbing gear for a look at the Northern Cleaver route from a high camp location. 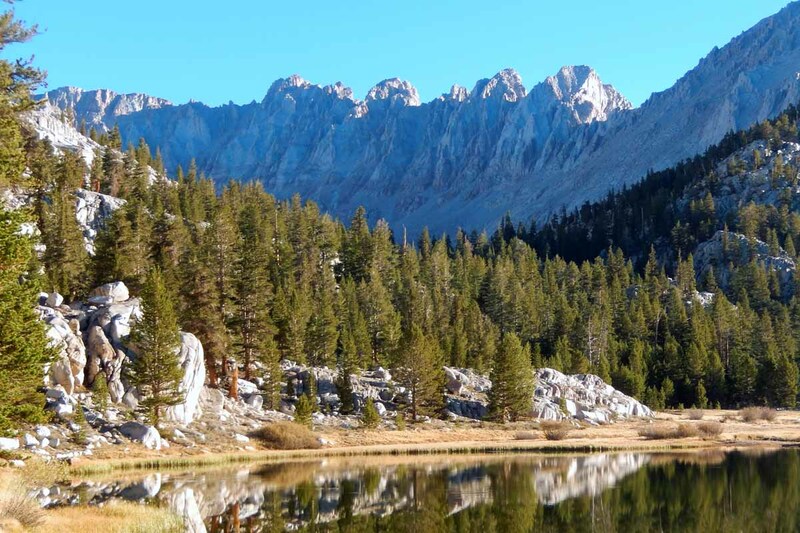 The various north face routes are primarily used as one way passage - that is, ascended but not descended because of loose footing, rock-fall danger and steep exposed sections along the route. 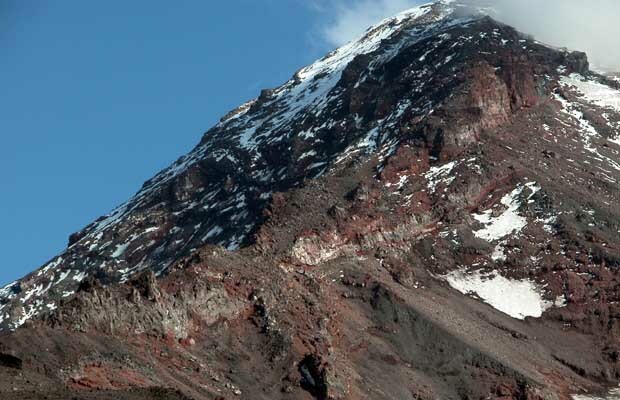 In this case, because the southern route - normally used for descent - was closed with the fire, if I decided to climb the Cleaver I'd have no option but to return the same way. Not a pleasant prospect. Viewed from my high camp at 7,500 feet, the Cleaver looked like a difficult climb, but proved relatively easy once I'd figured out the route. 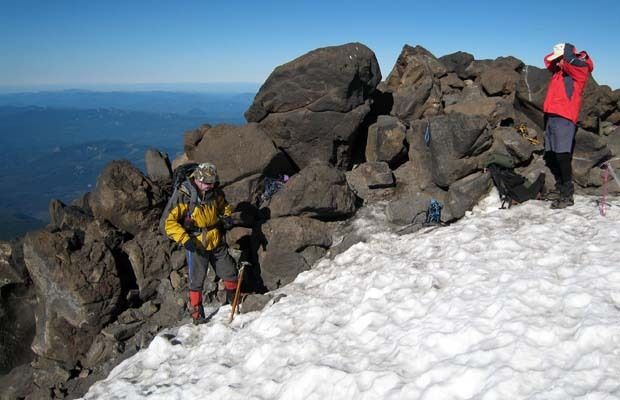 It was, however, a long, tiring day of scrambling to the summit and then returning, with great care, back down the narrow steep ridge to the camp. 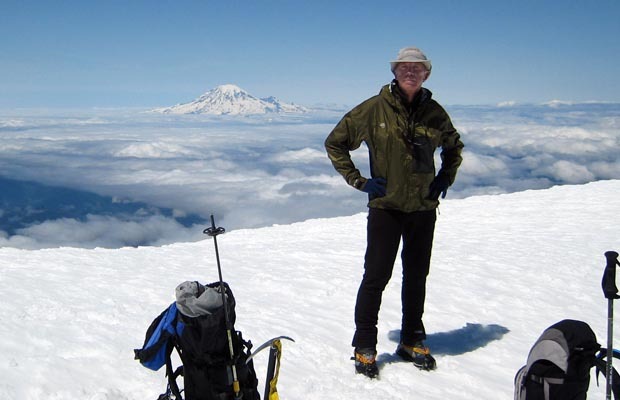 I encountered very few other climbers on the route and only one, Paul from Olympia, made it to the summit with me. The remainder turned back shortly after starting up the Cleaver ... either through exhaustion, or the realization they'd taken on more than expected. 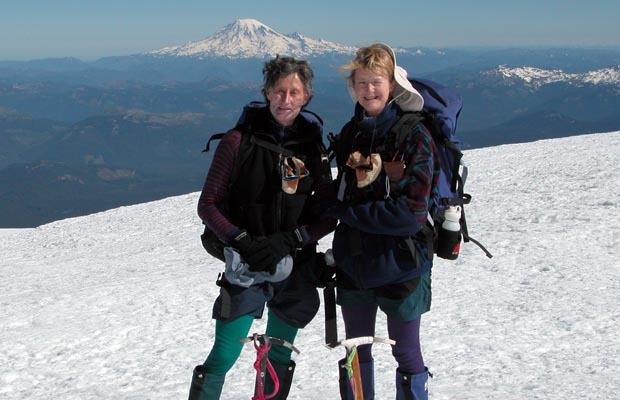 2005 North-South Traverse: This year, Lucy, Mal Hill and I decided to try a route on Adams much more challenging. 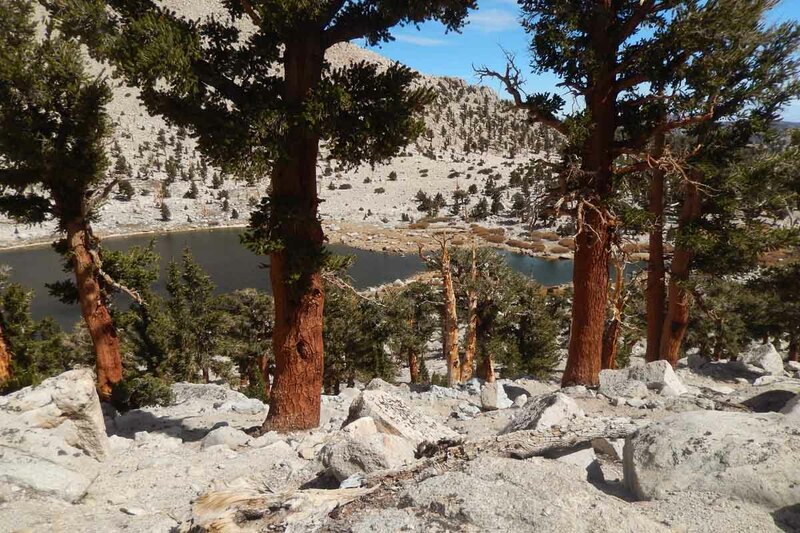 Our plan was to ascend the North Cleaver from Killen Creek trailhead, traverse the summit and descend via the standard southern route. This plan required us to carry overnight gear for three days on the mountain, including tent, stove and extra food. 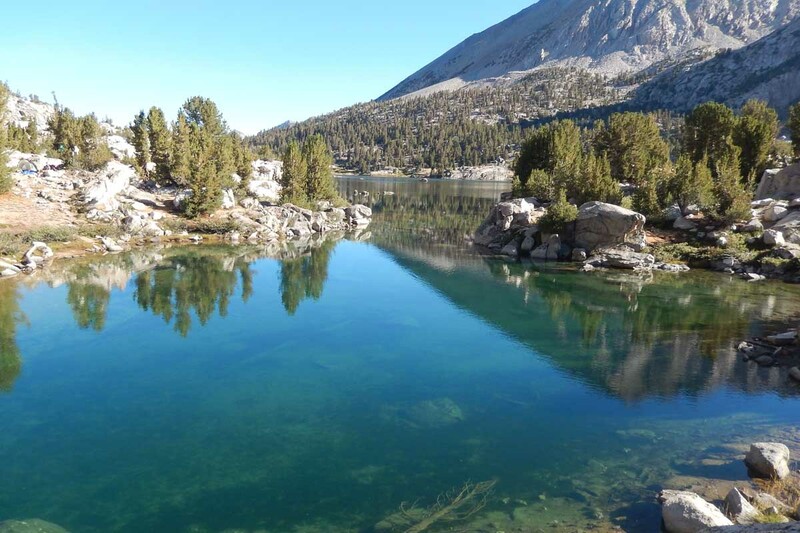 After some judicious selection of only the most necessary items we packed the overnight gear and climbing equipment into our three individual day-packs. 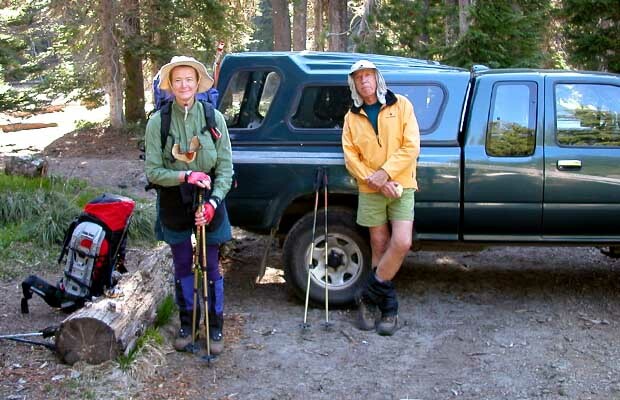 2005: Peter, Lucy and Mal at Killen Creek trailhead before starting our North-South traverse. 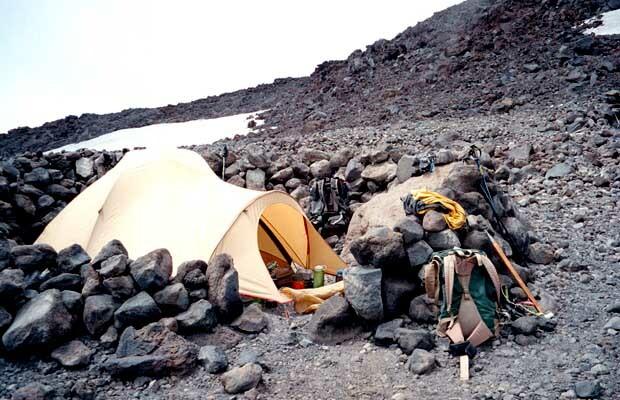 2005: Our camp by the glacial moraine lake -7,500'- at the base of the North Cleaver. 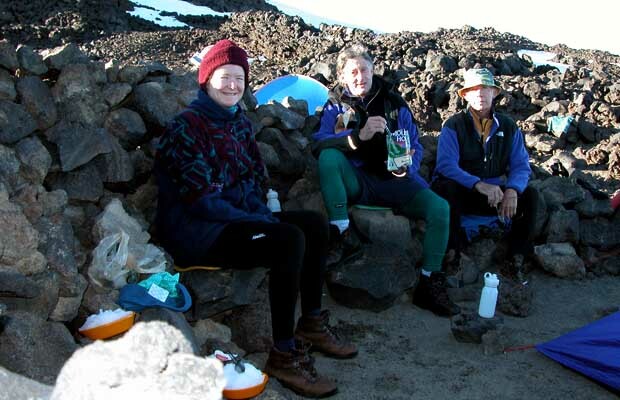 2005: Final preparation before leaving on the North Cleaver summit climb. 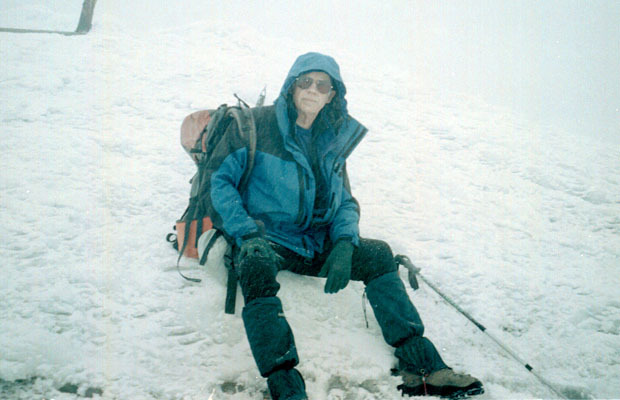 2005: Mal taking a break on the way up the steep, loose rock of the North Cleaver. 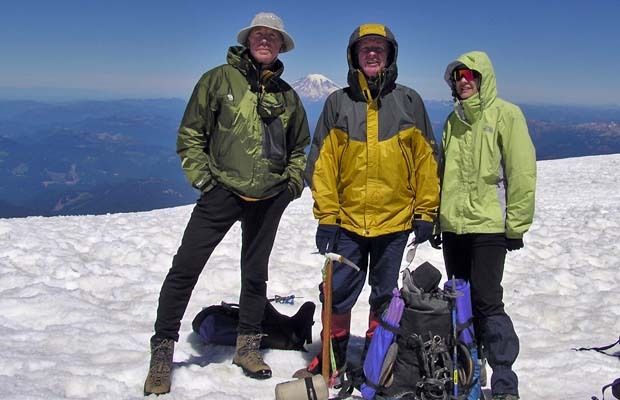 2005: The terrific trio triumphant, on the summit of Mount Adams -12,276'. 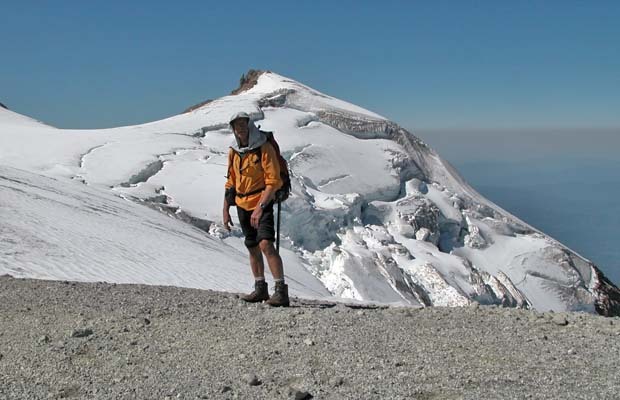 2005: Peter on the descent to Cold Springs at the conclusion of the Traverse. 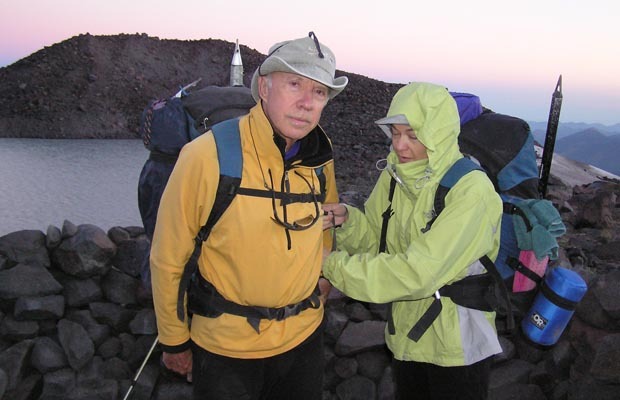 2007: Mal & Mike doing an early morning photo shoot as we leave camp for the summit. 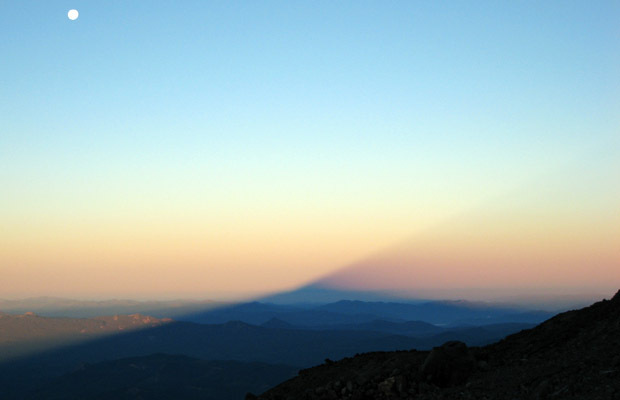 2007: Early morning on summit day with Mal & Peter starting the 2,000' climb to Piker's Peak. 2007: Peter on the steepest section of the climb from the Lunch Counter to Piker's Peak. 2007: Mal and Mike taking a break on Piker's Peak. 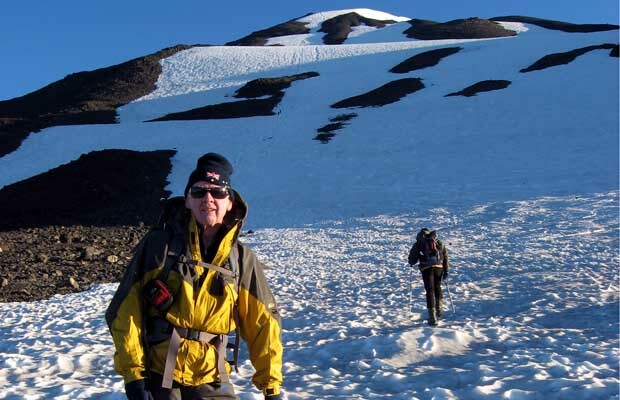 2007: Mike and Peter on the planks of the long disused hut at the summit. 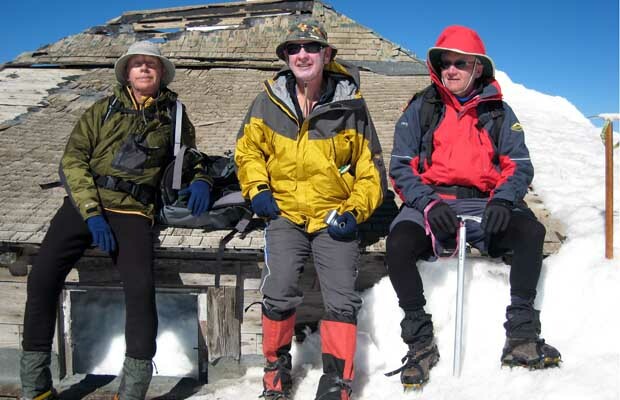 2007: Peter, Mal and Foxie sitting on the fire observation hut at the summit. 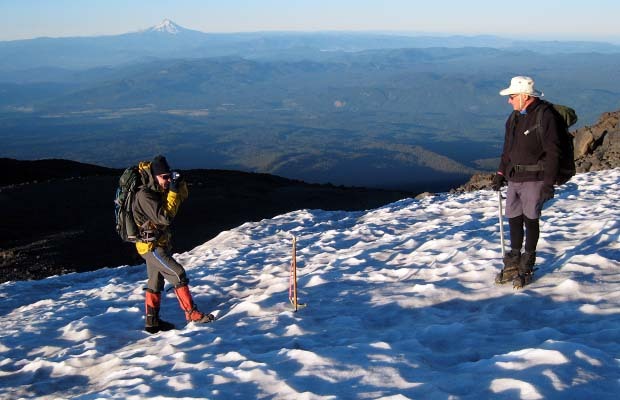 The snow melt came early to the lower south side of Mount Adams this year, enough to allow road access to the Cold Spring's trailhead by June 7 - the very day I showed up on the mountain, expecting that I'd be snow-shoeing the road from at least two miles below Cold Springs. 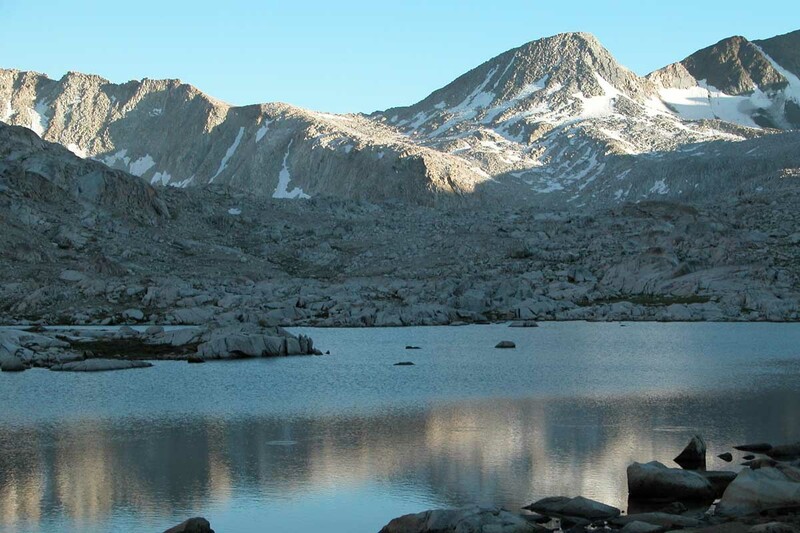 As a result, I decided to set out from the trailhead in early afternoon, trudging through soft snow for three hours before making camp at 7,600', well below the Lunch Counter where I've traditionally launched most summit attempts. 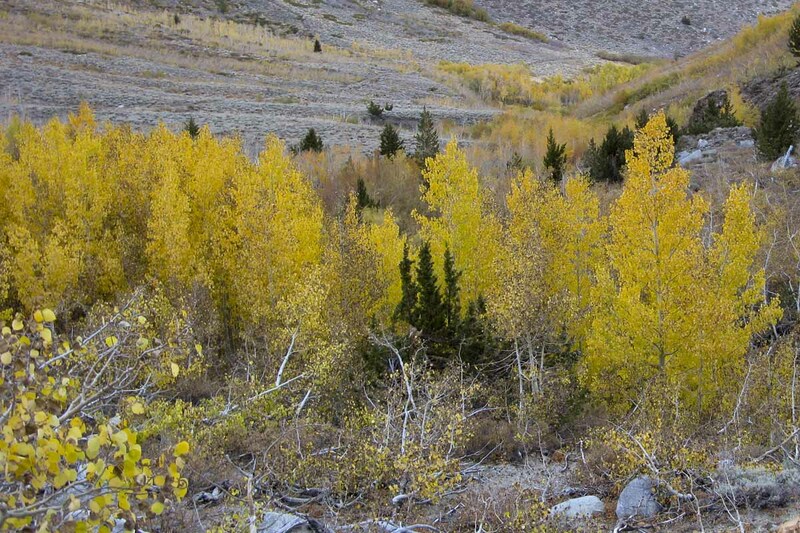 So the next morning when I headed for the summit, 5,000' above this low elevation, it was no surprise that my ascent would be long and arduous. Cloud obscured the land below, but the climb was completed in bright sunshine and no wind. 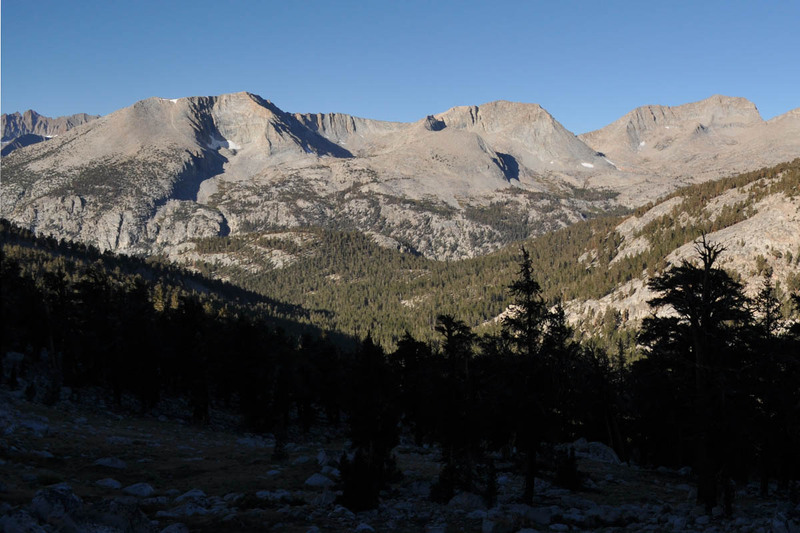 The round trip to the summit and back to my camp took 12 hours ... too tired to pack up and make the relatively short descent to the trailhead. 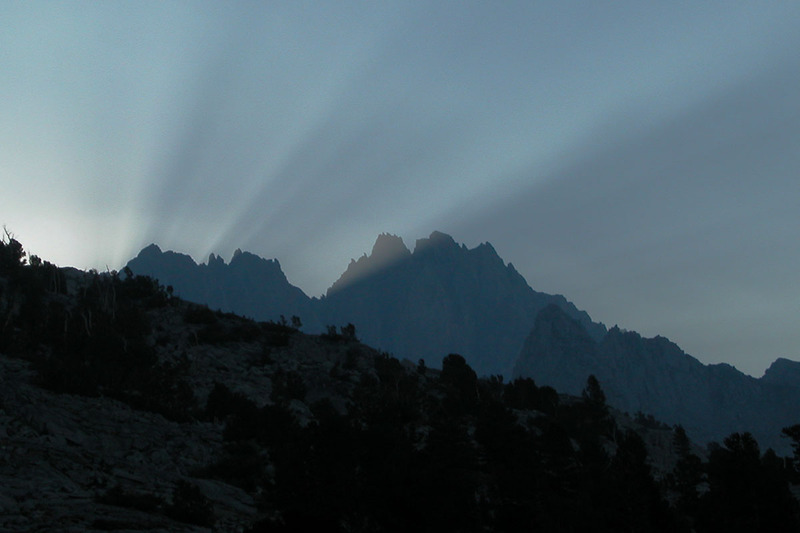 Another night resting on the mountain was a happy choice. Not a bad effort for the first big climb of the season and a timely reminder to always plan an early start on the first day. 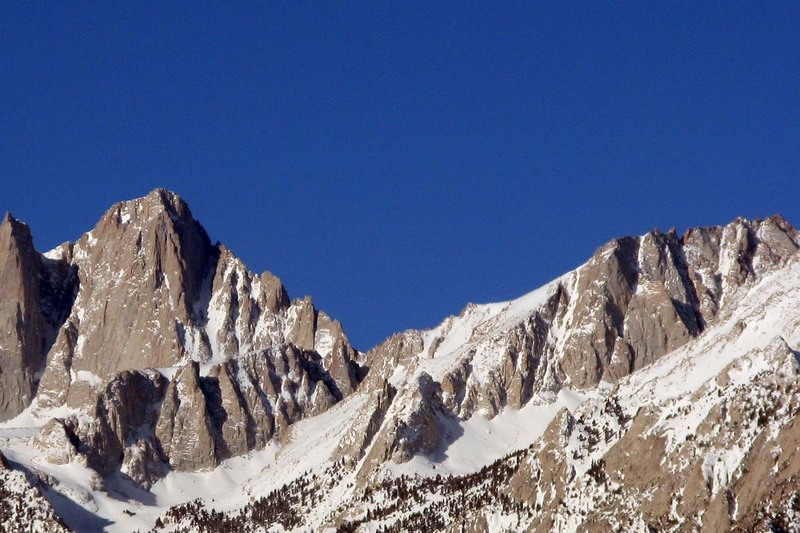 My second Adam's climb this year was in the company of Lucy, completing the first day's ascent to the high camp location above the Lunch Counter in 4.5 hours on July 16. 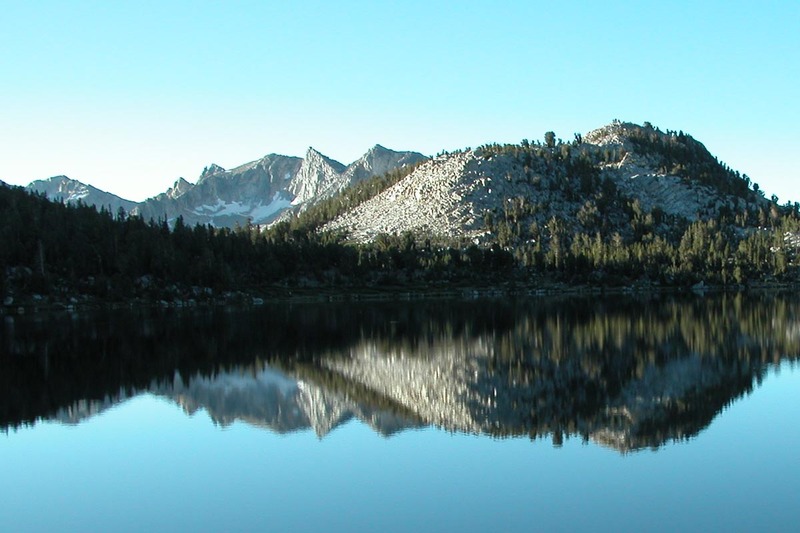 A very good time, helped considerably by our new lightweight backpacking equipment: Granite Gear packs, Black Diamond tent, Western Mountaineering sleeping bags and Thermarest Prolite mats ... recently acquired in anticipation of this year's John Muir Trail trek. 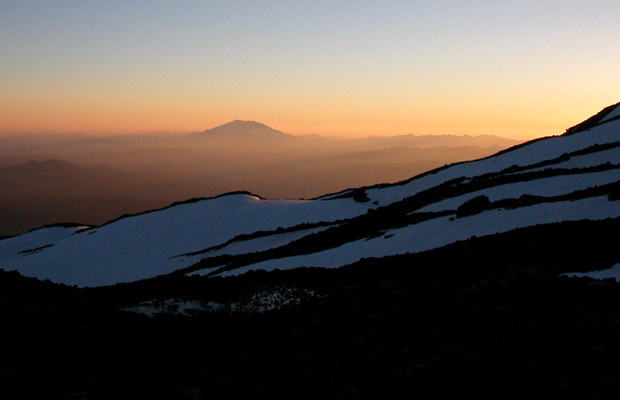 We rested comfortably with the new gear, but woke at first light to the sound of high wind and the sight of a significant lenticular cloud obscuring the mountain above. After a leisurely breakfast ... killing time in the hope the weather would improve, I finally made the decision to cancel the summit attempt, pack up and descend to the Cold Springs trailhead. 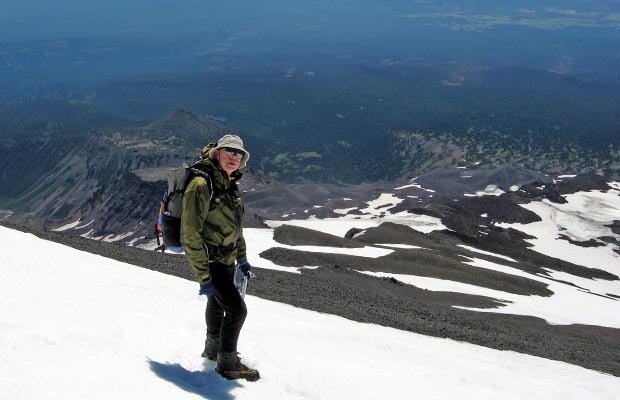 An unusual move for me on this mountain, because I can't recall giving away the summit in the 20 years of climbing Adams, including many ascents/descents in cloud, with and without GPS. I'm sure it was a good decision because the mountain just didn't feel right on this occasion. The third and final Adam's climb for the year was in the company of my Aussie climbing mates, Mal Hill and Mike Fox ... a most enjoyable trip in excellent weather from July 29 - 31. 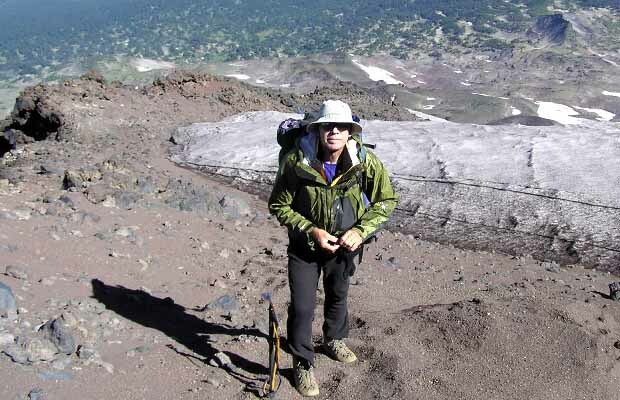 This was the last time I expect to have the pleasure of climbing the 'gentle giant' that is Mount Adams.